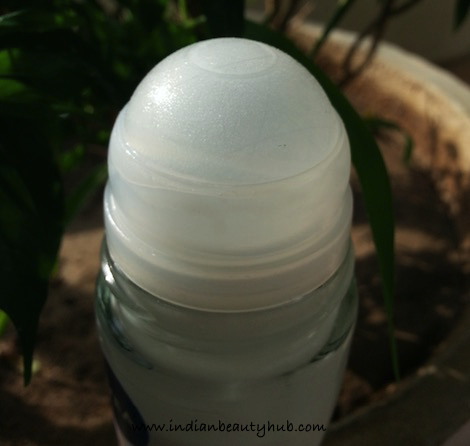 Hey everyone, today I’m reviewing the Nivea Whitening Smooth Skin Deodorant Roll-on which I’ve been using for the past one month. I prefer using roll-on deos instead of spray ones, specially during the summers. 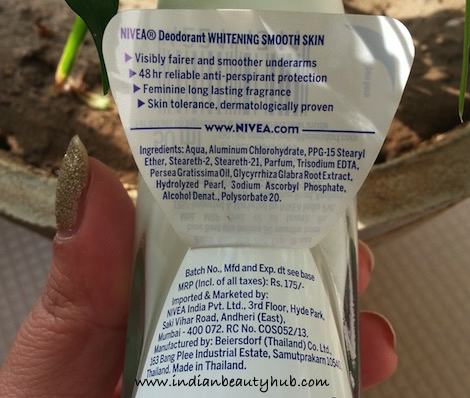 This is my 3rd roll-on deo from the brand Nivea, I’ve already reviewed the Nivea Happy Time Roll-On and Nivea Whitening Fairer Underarms Roll-on. 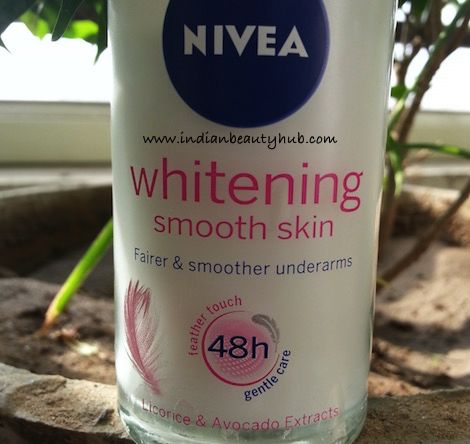 Packaging : Nivea Whitening Smooth Skin Roll-on comes in a white glass bottle with a screw cap. The packaging is sturdy, hygienic and very convenient to use. All the required product information is also provided on the bottle. 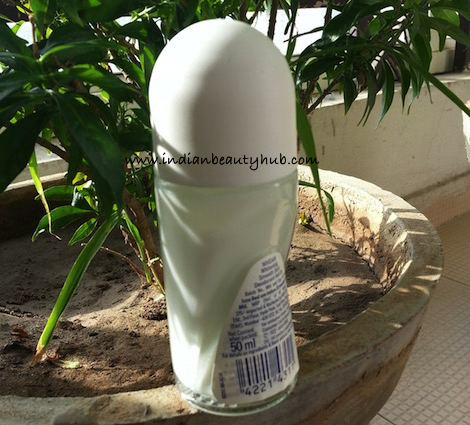 Texture & Fragrance : The bottle contains white liquid with creamy texture which helps in smooth application. It has a sweet floral fragrance which is not very strong and lingers on for up to 10 hrs. The fragrance is mild and doesn’t clash with the other scents like body mist, perfumes, etc. Efficacy : I use this roll-on deo every single day after shower, I roll it on my dry underarms. It glides easily on the skin and dries pretty fast without giving sticky, uncomfortable feeling. It doesn’t leave white marks on my clothes. It has anti-perspirant properties which helps control sweat and give dry & secure feeling throughout the day. It is very mild and doesn’t give burning sensation like spray deos. 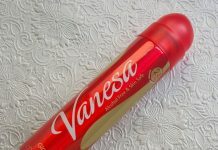 I use this roll-on deo during the day time only and wash it off before going to bed to make sure it doesn’t clog pores. 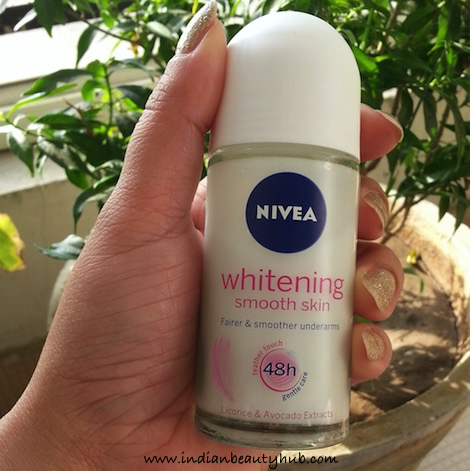 Price & Availability : The price of Nivea Whitening Smooth Skin Deodorant Roll-on is Rs.175 for 50ml. Nivea products are easily available at local beauty stores and you can also buy this roll-on deo online from leading shopping websites. I liked its convenient to use bottle packaging. Has a long lasting, mild fragrance which doesn’t clash with other scents. Non-sticky formula which doesn’t stain clothes. It controls sweat & odour and gives dry, secure feeling the whole day. It does lighten underarm skin up to certain extent. It is enriched with licorice & avocado extracts. It is reasonably priced and easily available. It is alcohol and parabens free. I find its skin whitening claims a little overwhelming. 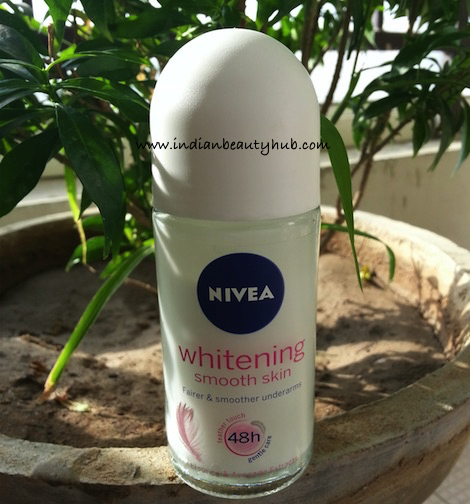 Overall I really liked Nivea Whitening Smooth Skin Deodorant Roll-on. It dries fast, controls sweat & odour and gives dry underarms throughout the day. Highly recommended!